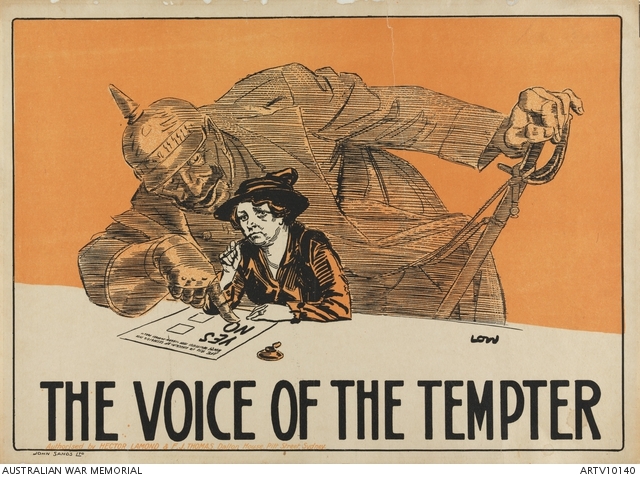 Michael Hamel-Green wrote in Green Left Weekly earlier this year an article called ‘When Australia voted no to war: the 1916-17 conscription referenda‘. The article is a useful brief introduction to the conscription struggle, an issue which the ‘Divided sunburnt country’ series will return to a number of times. At no other time in Australian history has the country been so divided as it was by the conscription struggle in 1916-17, yet the commemoration industry – even at a time when we have passed ‘Peak Anzac’ – will almost certainly ignore the centenary of these events. Instead, our attention will be diverted to commemorations of bloody battles (Fromelles, Pozières just passed, Passchendaele, Hamel, Beersheba, etc. to come), the expected extravaganza of the opening of the Monash museum (le boondoggle en Picardie) at Villers-Bretonneux in 2018, plus other events commemorating ‘a century of service’, such as the 50 year anniversary of the Battle of Long Tan in Vietnam. In all the official Anzac 100-year commemorations to remember and celebrate the undoubted courage of World War I diggers [says Hamel-Green], there is an extraordinary amnesia about how ambivalent Australians were about that war. This ambivalence grew as mounting casualties affected families all over the country and the 1916 Irish Easter Uprising was brutally suppressed. We remember the courage and suffering of those who fought and died in World War I but we also need to remember how the majority of Australians in 1916 and again in 1917 voiced their opposition to forcing young men into this war in a rare case of ordinary people being allowed to vote on matters of war and peace. The article has links to other material and events commemorating the conscription struggle. Michael Hamel-Green is an Emeritus Professor at Victoria University. He was an active opponent of conscription during the Vietnam War era.